The Erasmus+ KA2 project “European Business Baccalaureate for all (EBBD+) has almost come to an end. 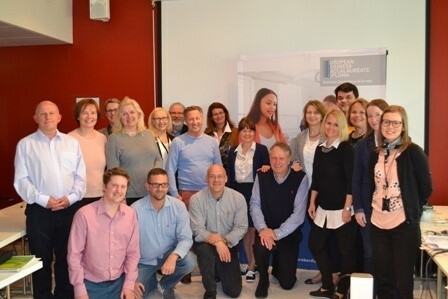 During the final meeting at the Helsinki Business College in Finland the members looked back to the achievements of the last three years with great satisfaction, as all the goals originally envisaged, have been achieved. It is obvious that this was a great relief for the Finnish coordinators of the project, who have spent a mere three years on properly organizing the course of the project, motivating the project partners and making sure that deadlines were adhered to. The label of excellence EBBD now has a strong foothold in Europe with partners in Finland, Denmark, the Netherlands, various states of Germany, Austria, Hungary, Spain and Greece. An important issue from this moment onwards is sustainability. All too often beautiful projects have been carried out under the auspices of Erasmus+, but their sustainability is at stake from the very moment the project funding and cooperation ends. For this reason an association – EBBD e.V. – has been called to life. This association will make sure that sustainability is guaranteed for many years to come. How does this work? If a school wants to be part of the network of schools that provide EBBD, it has to register as a member of the association. The board of the association will then check whether the school is a potential EBBD-member. This depends on a number of parameters, which can be found on the website of EBBD. If a school is eligible for membership, the accreditation procedure can be started up. After payment of an accreditation fee, the associate member can upload files into an accreditation tool that demonstrate the capacity of the applicant of fulfilling the demands of the EBBD-certificate. A member of the association, resident in the same country as the applicant, will check the application and advise the applicant accordingly. After accreditation, the applicant will be given a certificate of accreditation, a sign to be put on the wall of the institution, access to files on the website, such as learning materials and a certificate for students as well as an embossing die to validate the certificates. Accreditation is valid for three years. After that period a school has to be re-accredited again and then the accreditation period is valid for five years. Institutions have to be a member of the association and pay a – symbolic – membership fee. For that fee they will be given the opportunity to participate in annual meetings, organized in various countries of the EU, and to share their experiences with other members within the network. Student and teacher exchanges within the network are strongly emphasized and endorsed by the board of the association. Furthermore the association sees it as its task to not only disseminate the benefits of this European diploma, but also to inform its members of new developments within the relevant fields of education. These activities will take place during the scheduled annual meetings of the association, for which timely invitations will be sent. The association is registered in Bielefeld and is subject to German law. The board consists of a chairperson, a 1st and a 2nd vice chairperson, a secretary and a treasurer. Every three years the board has to be re-elected, and new members can be nominated by the members of the association. The current board of EBBD e.V. has the utmost confidence in these procedures, which will provide the necessary tools to guarantee sustainability for the EBBD-concept. Already EBBD-courses are being taught in no fewer than eight European countries and in various federal states of Germany. Application requests are coming from many schools at the moment and their number is growing. As soon as the EBBD-certificate is recognized not only by educational institutes, but also by the work field and the ministries of education in the various countries, we can speak of a sustainable result. That moment is not there yet, but now, only such a short time after the end of the project, the expected results are promising: EBBD is here to come and stay!